The CertBlaster® 70-646 practice test helps you prepare for Microsoft’s Windows Server 2008, Server Administration exam. With over 170 practice questions similar to the ones on the actual exam, this is an exceptionally comprehensive and complete practice test offering. 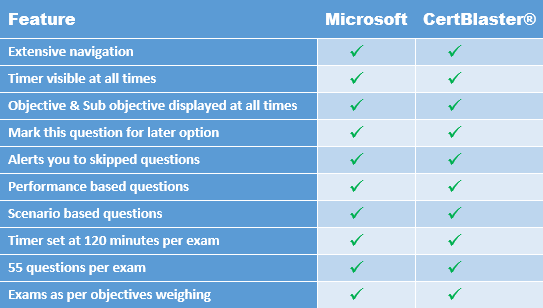 Because we have exceptionally comprehensive 70-646 practice tests: 179 questions! Because you get 3 complete exam simulations plus 5 Domain Drills (one for each exam objective). The Microsoft Certified Technology Specialist on Windows Server 2008 credentials are intended for information technology (IT) professionals who work in the complex computing environment of medium to large companies. The MCTS candidate should have at least one year of experience implementing and administering Windows Server 2008 R2. The expected background of the professional taking this exam would be a company with about 250 to 5,000 users with multiple physical locations and multiple domain controllers. Additionally the candidate is expected to have experience in network services and resources such as messaging, databases, file and print, firewalls, Internet access, an intranet, Public Key Infrastructure, remote access, remote desktop, virtualization, and client computer management. Finally you should have experience with connectivity requirements such as connecting branch offices and individual users in remote locations to corporate resources, and connecting corporate networks. 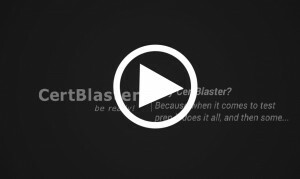 Because CertBlaster® today is 100% delivered online you can access the practice test immediately from any Windows PC or Mac via the internet. There is no legacy software to download, no installation, and you always have the best and greatest version of the tests as they are automatically updated.